This information is provided by Canyon Motoryachts. Please confirm all details direct with them prior to booking. Yachting Limited neither endorses Canyon Motoryachts nor guarantees the accuracy of this listing. and the Simpler Pleasures of Life. "Come, my friends, ‘Tis not too late to seek a newer world"
Canyon Charters provides fully crewed Motor Yachts, Sports Fishing Yachts, Off Shore Boats and Sports Boats for charter. Our cruising area of predilection is the Red Sea from the Gulf of Suez in the North, to Aqaba in the East, Egypt’s Southern Red Sea and to the waters off Sudan. Perfectly maintained, and crewed by experienced and professional crews, our yachts and boats are the perfect settings for outstanding vacations. Our yachts cater to those seeking an active, fun-filled holiday. They marry warmth, intimacy, style and human scale with professional management. Our yachts can take you to the very beginnings of time and history, to set foot where few others have before, to see nature as it was meant to be, and to develop a new appreciation for the world we live in. Tenders, diving and snorkeling equipment, fishing equipment, water skis, windsurfs and other water toys—and, on at least one of our yachts, a whirlpool spa—are available for your enjoyment. Whichever yacht you charter from us, this is Your Yacht, and the mood yours to set. Our yachts are manned by professional crews who provide service that is always attentive, friendly and cheerful—never intrusive. They are a team of motivated individuals, proud of their service and proud of their yachts—committed to making your vacation unforgettable. A crewed charter is a boating vacation where you let yourself be pampered, with the added thrill of waking each morning in different surroundings—effortlessly. A Canyon Charter is easy. 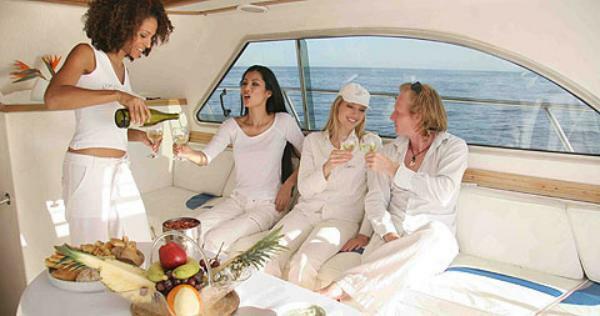 We take all the hassle of operating a yacht away leaving you to simply lay back and enjoy a great experience. We work hard to make your time on one of our yachts or sports boats, the best vacation you ever had. Our yachts will moor in turquoise lagoons, on the lee side of coral reefs, and out-of-the-way bays, often with golden beaches and nary a tourist in sight. There are no user reviews for Canyon Motoryachts yet. Be the first to add a review.